START KEELBOAT CRUISING. This is an actual course to take people with minimal water experience and teach them the terms and knowledge they need and the skills they need to develop to be a useful crew aboard a skipper yacht. This is done over a weekend or evenings and will give you certification as a crew. Starts as low as $250 per person. DAY EXPERIENCES -- Am I a Sailor? Do I really want to get involved in Sailing? Try one of these introductions before you commit. 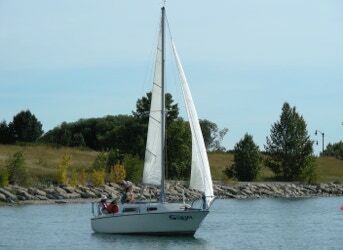 Get out with a skipper and let him show you how easy sailing really can be. Be careful, as this is a slippery slope and once you have tried it is hard to walk away from our courses or further charters. This wonderful opportunity starts as low as $75 person. BAREBOAT CHARTERS -- We do offer limited Bareboat Charters here in Calgary for sailors who wish to hone their skills and gain further experience aboard Soryu. Depending on your certifications and experience on Glenmore, a skippered charter may be necessary to acquaint you with the boat, docking and launching and retrieving the boat. These charters can be arranged for a one week or for five days spread out over the summer. Prices are as low as $800. Although we no longer offer bareboat charters at the west coast we can help you arrange one or discuss bareboat charters worldwide. We also help you prepare for your charter through catch ups or advancement of your prerequisites like Coastal Navigation reviews, VHF Radio endorsements and discussions of venues and attractions.